Roast the peppers on your preferred device (grill, stovetop, oven) and let them sweat for 10 minutes after roasting. Remove the skin and seeds, and chop the peppers up, and set aside. Saute the garlic in the butter for a minute. 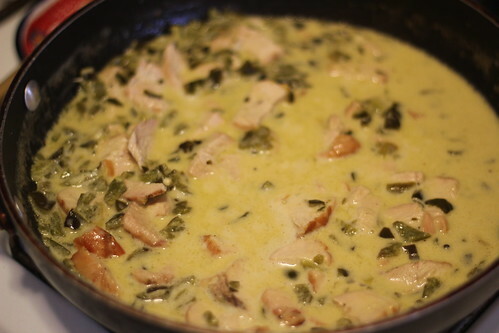 Add black pepper and white wine and bring to a simmer and let it reduce down a bit. Add chopped peppers, heavy cream, and salt and let it simmer for 6-8 until thickened. Serve over pasta. Modifications: We also grilled a couple chicken breasts while we were roasting the peppers and put some chicken into our sauce as well to give it a little protein. 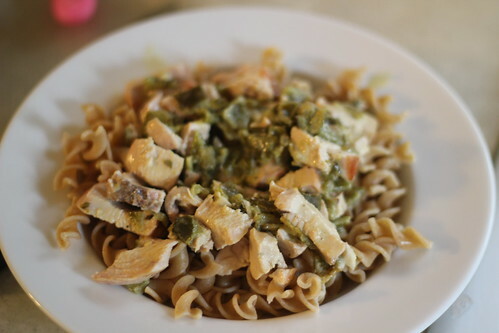 This entry was posted in chicken, cream, garlic, pasta, poblano pepper, white wine. Bookmark the permalink.